Beautiful Jacquard ribbon with Blue or Yellow Crabs. A must have if you are going to the ocean, beach or just to the river. 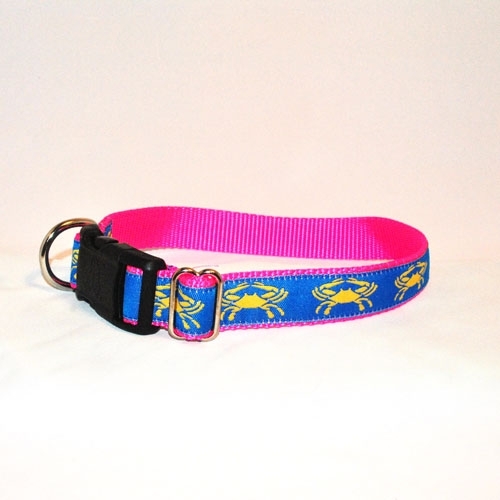 Blue & Yellow Crabs dog collars & martingales – designer ribbon sew securely over soft heavy weight nylon. Top quality heavy welded D rings and rectangle rings, contoured side release buckle. All dog collars and martingales are triple stitched for extra strength and security. A portion of our proceeds are donated to Shelters across the USA and special animals in need. Matching leash available. Leashes are 5 ft long. If you would like a different size please email us. Be the first to review “Blue Crab & Yellow Crab -SMALL Dog Collar, Martingale & Leash” Click here to cancel reply.